24 August 2015, Bangalore: In a significant announcement today, Sonata – India’s largest-selling watch brand from Titan Company Limited, launched a brand new identity for their Super Fibre range of watches. SF by Sonata is dedicated solely to the timekeeping needs of adventure enthusiasts and aims to deliver revolutionary products to its customers. A unique range of touch screen adventure watches were unveiled on the occasion and the months ahead will see many exciting offerings in the adventure gear space. 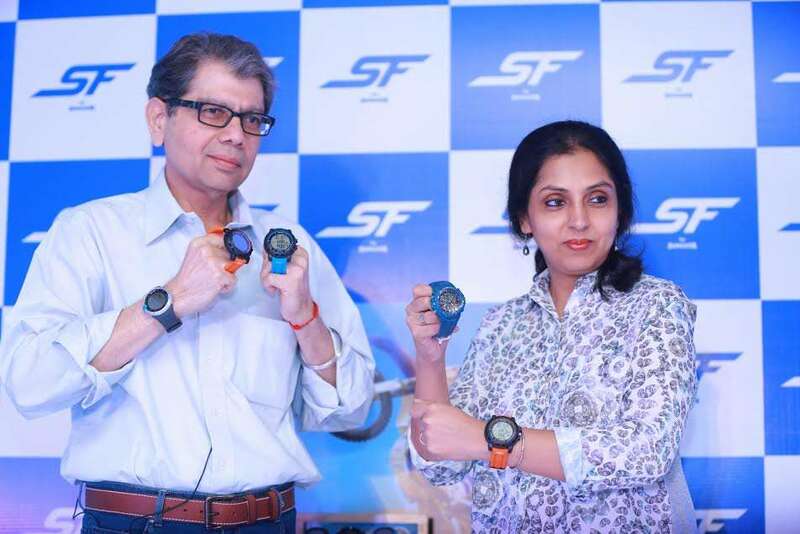 Mr. S Ravi Kant – Chief Executive Officer, Watches and Accessories Division, Titan Company Limited and Ms. Suparna Mitra – Chief Marketing Officer, Watches and Accessories Division, Titan Company Limited unveiled a new logo for SF by Sonata and shared enthusiasm on the brand’s foray into the adventure sports space in India. Celebrating the milestone, Mr. S Ravi Kant and Ms. Suparna Mitra, launched The Touch Series watches- a collection that combines sport & tech. The new age Touch Series watches are multifunction digital sport watches designed to provide accessibility simply by touching/swiping the screen, doing away completely with push buttons. Sonata SuperFibre launched its first touch screen watch in 2012, which was a game changer and an instant hit with the Indian youth. The new Touch series takes it to the next level by introducing the first ever Slide Touch watch. You can now swipe your Digital watch just like you would swipe on your phone! The Slide Touch watch in the Touch series collection is designed with an interface similar to a touch phone’s screen and can be swiped in four directions. The watches are available in three unique designs and 13 variants. The Touch Series watches are priced between Rs. 1, 799 and Rs. 2, 899 and are available in over 8,000 outlets across India including World of Titan stores, multi-brand outlets and authorized dealer stores. Sonata is India's largest selling watch brand, from Titan Company, a TATA group company. It has established itself as a brand of great quality and unbeatable value for the customer. The brand has an annual sales volume of 4.6 million watches and is sold through a strong retail network of over 8,000 dealers across the country. Every watch purchased comes with a 1 year guarantee. Today, Titan Company, India’s unchallenged leader in watches, jewellery and eyewear, is credited with changing the face of all these industries. The Company closed financial year 2014-15 with an income of Rs. 11,791 crores, registering a growth of 9% over the previous year.